Featuring innovative Eco-Drive technology, this stylish men's watch from Citizen is a perfect balance of style and function. Featuring a stylish deep blue tone chronograph dial complete with date box, this sleek watch is finished with a brown leather strap. Distinctive design for everyday timekeeping. 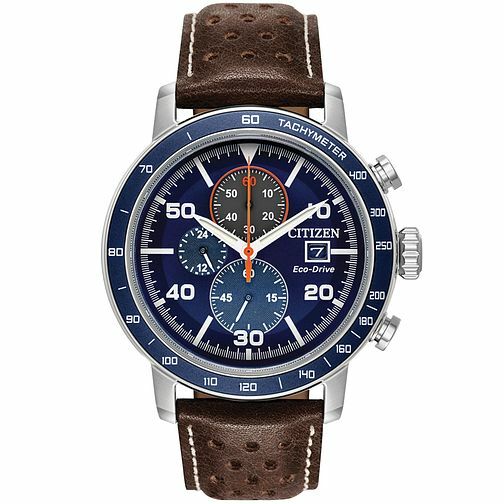 Citizen Men's Brown Leather Blue Chronograph Strap Watch is rated 4.0 out of 5 by 2. Rated 5 out of 5 by Anonymous from A watch of quality at an affordable price. I bought this for Christmas for a family member and he loved it. A large but very stylish watch which stands out from the competition due to its quality build and eco-drive technology. Rated 3 out of 5 by Anonymous from Disappointing watch Although this watch is a great looking timepiece with its blue face and leather strap, that unfortunately, is about as far as it goes. My two main criticisms of it with regards to recommending it to anyone else are firstly, it is extremely uncomfortable to wear. I’ll accept that I may have thin wrists, but this watch constantly either fell over to one side or if strapped on tightly, made my wrist sore. Secondly the date window is a joke. Due to the background colour of the window and the colour of the digits, it is almost impossible to read. Consequently because I have tried wearing it a few times, I felt I couldn’t justify returning it so it languishes in a drawer awaiting an appearance on e-bay.